The Apex Friendship High School Patriot Regiment is comprised of musicians as well as Color Guard. The Patriot Regiment is proud to represent the school in many events throughout the year, but the primary season is in the fall. 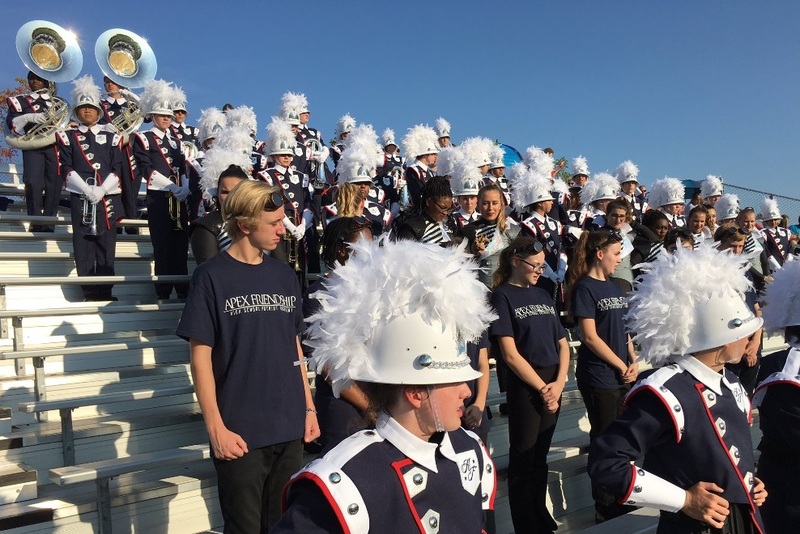 The marching band is a voluntary ensemble, and perform at home football games, local Christmas Parades and other internal student body performances. The Patriot Regiment also competes in the fall at several local and regional high school marching band competitions. Members of the Patriot Regiment may also be enrolled in Academic Band classes, but it is not required. Students are expected to attend Marching Band Camp, which begins in July, all home football games, competitions and parades. After school rehearsals commence once school is in session. There are fees associated with membership in the marching band. Color Guard members come from a wide variety of backgrounds, many with dance, cheer or theater experience. The Color Guard is in integral part of the Patriot Regiment, bringing visual and artistic elements to the drill performance, to highlight the theme of the show or create a mood with flags, rifles and other equipment. Auditions for Color Guard are held in the spring for the fall marching band season. Color Guard members are expected to attend Marching Band Camp, which begins in July, all home football games, competitions and parades. After school rehearsals commence, once school is in session. There are fees associated with membership in the Color Guard.